Guatemala and Hawaii are still dealing with the aftermath of the eruptions that have occured on their islands a month ago. In Guatemala, the Volcano of Fire, the region’s most active erupted. There, the total death count currently is still being decided, however, the toll from the catastrophic eruption has risen to 113 with an estimated 332 people still missing. The health ministry has reported that 58 people are in hospital with third-degree burns and twelve children are being transferred by air to specialist hospitals. Asphyxia is reported to be the main cause of death, followed by burns. Guatemalan President Jimmy Morales had instructed his foreign ministry to petition the United States for temporary protected status for the country’s migrants due to the damage. The Guatemala Red Cross has been the primary response to the disaster with more than 1,640 volunteers mobilized to provide medical care, transport wounded survivors to hospitals, support evacuations, work in shelters hosting evacuees and help family members separated by the disaster to reconnect. While Hawaii has had no fatalities from the eruption itself, one man was seriously injured when a molten rock projectile shattered his leg while he was standing on a balcony. 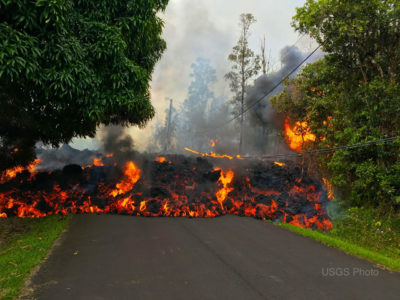 Kilauea’s eruption on June 28th exploded with a force equivalent to an 5.3 magnitude or higher earthquake, according to the U.S. Geological Survey. It was the biggest of more than 400 earthquakes of magnitude 2.5 or higher that have struck in the vicinity of the volcano in the two days prior, the overwhelming majority of which were minor temblors. President Trump has approved federal emergency housing aid and other relief for victims of the seven-week old Kilauea Volcano eruption, where hundreds of homes have been destroyed, state officials said. The approval came a day after governor David Ige formally requested assistance for an estimated 2,800 residents who have lost their homes to lava flows or were forced from their houses under evacuation orders. In a comparison of the two volcanic eruptions, the Guatemalan volcano has been deadlier because it erupted with a mix of ash, rock, and volcanic gases — a rapid pyroclastic flow, compared to Kilauea’s slow-moving lava. These fast-moving flows engulfed whole villages at the bottom of the volcanic slope, overtaking people or vehicles quickly. If you wish to help with aid efforts to donate, you can check out either of the links below.